Buying the best self-cleaning fish tank makes it easier to keep fish with less commitment and maintenance, right? NoClean or self-cleaning fish tanks are not suitable to house fish. They tend to be very, very small and cannot provide the environment you need to house healthy fish. and, they’ll require more, regular maintenance. 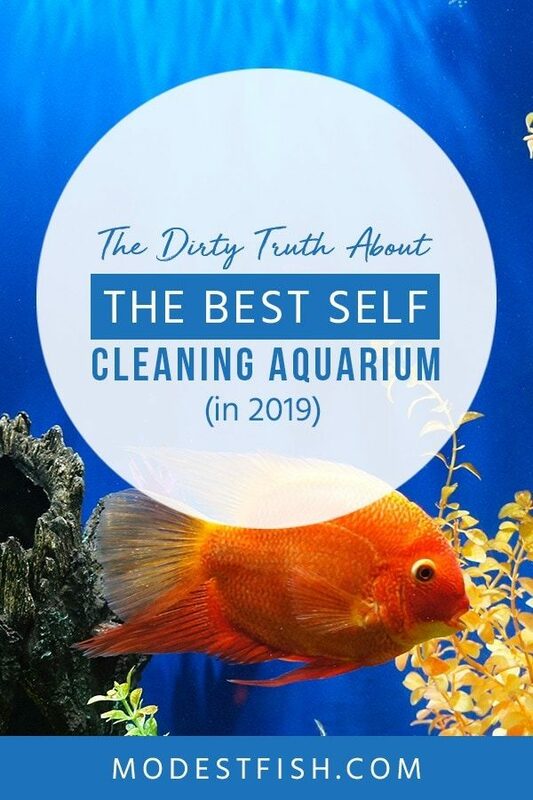 Well, in this article, you’re going to discover why ‘self-cleaning’ fish tanks are a marketing gimmick–they don’t actually clean your tank for you and are a waste of your time and money. I’ll then share with you the secrets all experienced hobbyists know when to comes to owning a fish tank that requires minimal maintenance. The big problem here, is most companies will advertise these tiny self-cleaning fish tanks to beginners, children, or innocent people who do not realize the damage they’re doing to fish. Human friendly? Yeah… if you like having regular funerals for your family pet. And fish friendly… we’ll get to that. What you need to know is, the size of your fish tank really does matter. The main reasons why most people buy self-cleaning fish tanks is because they think it’s going to be a low-risk way of giving a child a pet or think it will require less maintenance. However, all you’re doing is setting children (or yourself) up for failure. Self-cleaning fish tanks are very small. This one advertised by NoClean Aquariums isn’t even one gallon. And guess what, small fish tanks are much more difficult to care for. In fact, they’re so difficult to maintain, it’s recommended only the most experienced hobbyists use small aquariums. When you eat, you produce waste. It’s the same with fish, except–they have to live in it. Just take a moment to imagine if you were placed into a confined area with no escape from your own waste. I wouldn’t, and I doubt you would. When the ‘NoClean’ ‘self-cleaning’ aquariums were made, clearly, no one had any understanding of the nitrogen cycle and it’s importance in providing your fish with a healthy environment. When your fish produces waste or uneaten food is left to rot, it produces a substance called ammonia. This is extremely toxic to fish. And when in a small aquarium, you don’t need much to harm your pet. However, when you have a larger tank you can perform what’s known as the nitrogen cycle. This is a process where ammonia (toxic), is converted to nitrite (toxic), which then converts to nitrates (not toxic in small amounts). When you have a small volume of water, these can build up to dangerous levels very quickly and there isn’t enough water to dilute the waste. Resulting in your fish contracting diseases and dying prematurely. You can find out more information here and here. When it comes to fish keeping, one of the first things any experienced hobbyists will tell you is, you need stable water parameters. Get this right, and you’re on the right to track to success. 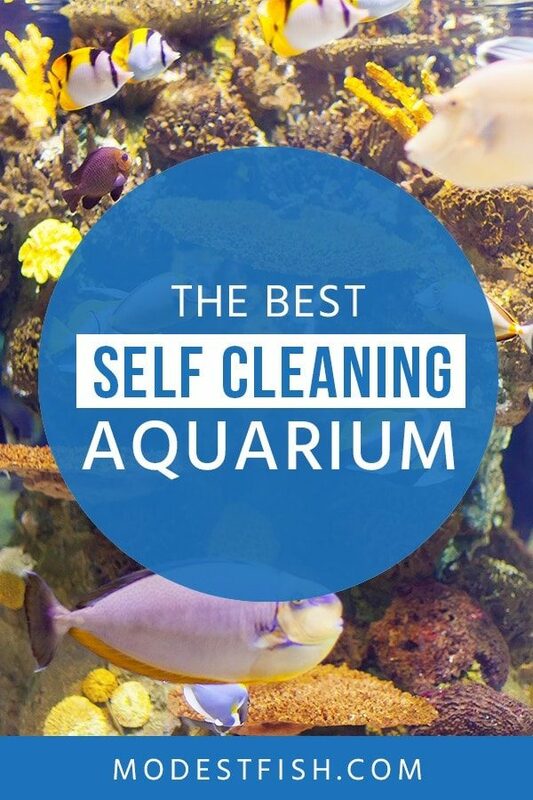 Which is exactly why these small self-cleaning fish tanks are so bad. You have almost no leeway when it comes to mistakes. And you’re going to make mistakes–trust me. Having a small volume of water means any changes in pH or temperature increases the chance of your stress your fish. And stress is one of the main causes for most fish diseases. 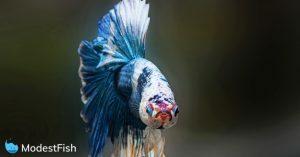 Stress triggers an alarm reaction (fight or flight response), in fish. This results in a number of changes in their body. They’ll secret a hormone from their adrenal gland, increasing their blood sugar, giving them a bust of energy which prepares your fish for an emergency situation. Now, that doesn’t sound so bad. The inflammatory response, which is designed to help your fish fight against disease, is suppressed by the hormones released by the adrenal gland. The water balance in your fish becomes disrupted due to the change in metabolism of minters. Causing freshwater fish to absorb excess amounts of water and over-hydrate; saltwater fish will lose water and dehydrate. This disruption increases the amount of energy needed for osmoregulation (ability to regulate body fluids). Respiration increases, blood pressure rises, and reserve blood cells are released into the bloodstream. 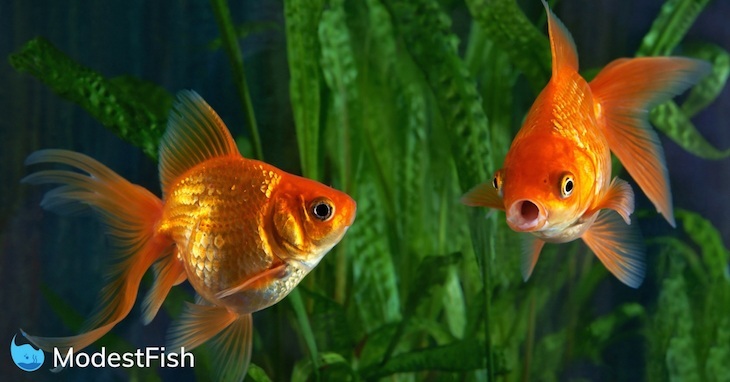 Your fish will be able to act ‘normal’ and adapt for a short period of time. However, their energy reserves will become depleted, more hormone imbalances will occur, and their immune system will become suppressed–massively increasing their chance of contracting a disease. Smaller tanks means less water, less water means less oxygen. Small tanks have limited surface water and less movement, which can prevent enough gas exchange taking place between the water and the atmosphere. Filters, water pumps, and air pumps are some of the best ways you can create more water movement. But, guess what, just like the advertising said… a tiny self-cleaning tank cannot accommodate any of these. Self-Cleaning Tanks Are Less Work Though, Right? Owning a pet is a serious responsibility. Not something we look to do out of ‘convenience‘. I do laugh sometimes, because you know, “self-cleaning” fish tanks don’t clean the tank. Think about it for a second: how do they work? They use a pump to syphon out dirty water from the bottom as you add clean water in at the top. You add the water. So they’re not self-cleaning at all. They’re lazy. Seriously, how do these companies think filters work? Filters work by pumping dirty water through media in order to remove waste and replenish your tank with beneficial bacteria to maintain the nitrogen cycle. ‘Self-cleaning’ or ‘no-clean’ are a gimmick. Designed to lure innocent, unsuspecting people into thinking they don’t have to look after their pet. You still have to perform 50% water changes every 2-3 days. And if you don’t keep on top of these regular changes, for reasons mentioned above, you’re going to have a lot more problems. Oh, and regular large 50% water changes will also stress your fish. In fact, even if you keep on top of these, you’re still not going to prevent most of the problems mentioned above. And consistently stress your fish. Whereas if you get a proper beginner tank (approx. 20-gallons), you’ll only be performing one 20-25% water change per week. It’s true, it will take you a bit longer to perform a 20-25% water change on a 20 gallon tank, compared to one on a 1 gallon. But, really this argument is redundant. What’s easier to stay on top of? 2-3 times a week or once a week? Once a week. And actually, contrary to popular belief, the majority of regular maintenance work does not require twice as much time for twice the size. For example, a regular once a week water change may require one more buck of water to be replaced in a larger thank. However, that doesn’t translate into twice as much work–you already have the bucket a siphon ready in your hands. So, now you know the dangers of keeping a fish locked inside a tiny self-cleaning tank, which actually still requires you to clean it through water changes every 2-3 days, what do you do? Don’t buy a small bowl, vase, or self-cleaning tank. If you really, really want to keep fish or buy one for a child, why not look into buying a complete kit? You can get aquarium kits that come will all of the essentials you need to run a healthy aquarium. And the best part is, they don’t cost a lot to run, come with all the equipment you need to get started, and don’t require as much attention or maintenance. 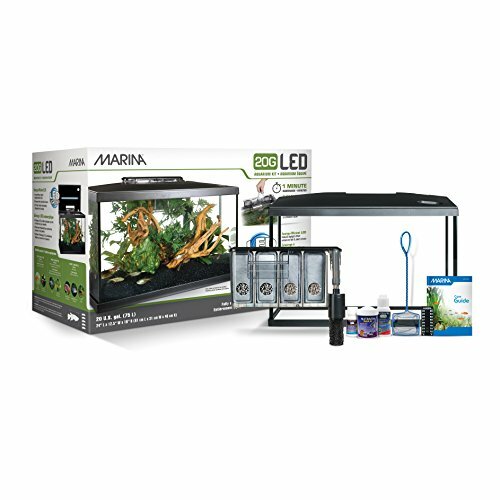 A complete starter kit, the Marina LED aquarium is available in a range of sizes and includes everything you'd need to get started creating a healthy environment. These aquariums tend to have 3-stage filters built in, which will provide the biological, mechanical, and chemical filtration needed to keep your aquarium healthy and reduce the amount of time you have to spend cleaning and changing the water. Proper filtration will encourage the growth of beneficial bacteria in your tank, lowering the chance of you experiences a toxic spike in ammonia. Hey, even if you do make a mistake, a child feeds your fish a cookie, or your filter breaks, because you’re dealing with a much larger body of water any chemicals are diluted. Meaning, it’s much less likely you’ll harm your fish. Bigger tank means more options when it comes to choosing how many and what type of fish you want. 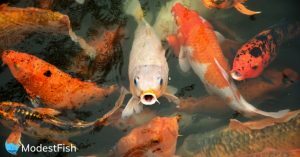 Most beginner fish, which are easier to take care of, do much better in schools of about 6 and require at least 20 gallons tanks. Because you can safely add a heater, you can keep beautiful tropical fish. If you want to add more, you can do that instead of buying a whole new tank. Just do you research and make sure there’s still enough room and they are compatible with your current fish. If you end up really enjoying yourself, and I promise you–you will, you can then start to venture off into the wonderful world of aquascaping or reef keeping. When you’re dealing with a larger volume of water, any change in the environment is going to be less intense than if it was in a small one. And actually, it’s much easier to regulate. You can now safely use a thermometer and heater (both inexpensive, you can see some here and here), to ensure the temperature of your tank is stable. If it malfunctions and overheats or stops putting out heat, it will take longer for a bigger tank to get to a dangerous temperature. When you’re not consistently burying the family fish, it becomes a much more enjoyable experience. This is what I’m trying to get at here. Overall, the bigger your aquarium, the easier it is to maintain and keep a healthy fish. Keep at fish in a tank that small and you’re actually causing it physical harm. And for anyone who says the size of the tank doesn’t matter, read this study. Now, this certainly isn’t true for every aspect of life. However, when it comes to fish tanks–it’s 100% fact. Self-cleaning fish tanks don’t even clean your tank, you still add the water. It still makes me chuckle. If you’re serious about wanting a fish tank with less maintenance, go bigger, and get yourself a starter kit. Your chances of success will be improved 10 fold. Thank you Mr Adams, actually makes perfect sense. One of my daughters has asked for some pet fish for her birthday, my initial thought was small self cleaning tank. I can assure you that’s no longer the case. Easy & educational read, thank you. Thank you very much Adams!!! I was thinking about getting 2 self-cleaning fish tanks to surprise my kids. I am very glad that I have come across your very educational article. Thinking about it, we like to travel when the kids are off school; so, small self-cleaning tank would not work for us. Again, thank you very much!